Source: Mitsubishi Heavy Industries, Ltd.
TOKYO, Feb 12, 2019 - (JCN Newswire) - Mitsubishi Heavy Industries Engineering, Ltd. (MHIENG), a group member of Mitsubishi Heavy Industries, Ltd. (MHI), is to deliver an additional six railway carriages of an automated guideway transit (AGT) system(1) for the "New Shuttle" transportation system operated by Saitama New Urban Transit Co., Ltd. in Saitama Prefecture(2). Prior to this, since 2015 MHIENG had already delivered 18 of its "2020 Series" carriages to replace existing cars used on the New Shuttle line. 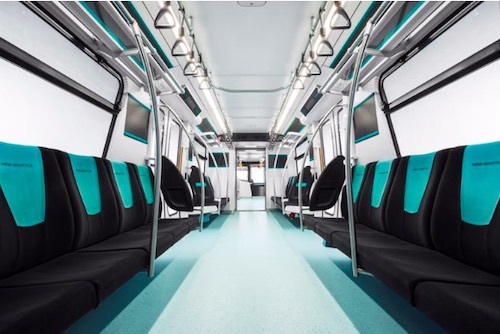 The newest six carriages are of "Golden Topaz" hue, part of a comprehensive color scheme that will eventually encompass seven different hues on seven six-car trains, creating a rainbow of colors to depict the transport line's radiant future. 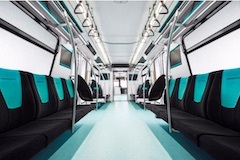 The newly added six carriages incorporate the latest technologies and design features to complement the 18 cars previously delivered, currently in operation, which have marked a complete renovation for the transport line. At the same time, however, the newest six carriages also incorporate a number of significant improvements from the earlier cars. For passengers, vertical vibration during operation has been reduced to provide a smoother, more comfortable ride. Security cameras have also been installed in the carriages to enhance passenger security. In addition, positioning of handrails has been modified to provide greater safety to standing passengers. For drivers, the steering apparatus has been improved for added safety in the cockpit. The driver's seat has also been redesigned to enable the optimum driving position for all drivers, regardless of height, weight, etc. To provide maximum comfort to the 50,000 passengers who ride the New Shuttle on any given day, MHIENG engineers analyzed the frequencies that impose stress on the human body and redesigned the bogie area. The AGT's "G-Fit" seats--already designed to provide outstanding body support while naturally inducing seated passengers to keep their legs tucked close in and prevent them from extending into the aisle space--have been enhanced for greater comfort through the adoption of the latest resin technologies in the seat cushions. The 2020 series carriages are more than 1 ton lighter than earlier cars, thanks largely to the adoption of an unpainted all-aluminum-alloy double-skin structure. In addition to minimal power consumption and further reduced impact on the environment, the cars also contribute to curbing the operator's running costs. The 2020 cars adopt MHIENG's newest "T-smover" bogie, providing outstanding riding comfort in addition to the advantages of lightweight construction, robust durability, low vibration and noise, and easy maintenance. The T-smover already has a proven track record on the Yurikamome and Nippori-Toneri Liner systems. 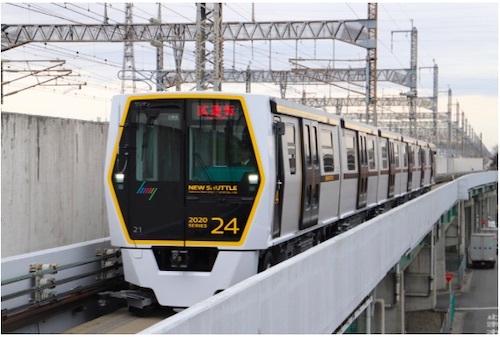 The 2020 series carriages became widely known via Mass-Trans Innovation Japan 2015, complemented by their winning of a "Good Design Award" in 2016. With their unique, futuristic design, they have already become a popular symbol of the New Shuttle line. Inside, the carriages are designed for comfort and practicality through the adoption of a hexagonal transverse cross-section design; this configuration enhances the spaciousness of the interior by providing an ideal slant to the seatbacks. To date, MHIENG has produced a variety of AGT systems for the Japanese market. These include: the 7300 series carriages used on the Yurikamome transit line linking Tokyo's central districts with the newly developing waterfront area, winner of a 2014 "Good Design Award" (from the Japan Institute of Design Promotion) for outstanding renovation of public transport; the 330 series cars adopted on the Tokyo Bureau of Transportation's Nippori-Toneri Liner system inaugurated in October 2015; the 2020 series featured on Saitama's New Shuttle, which went into operation in November 2015; and new carriages for Hiroshima Rapid Transit's Astram Line, ordered in 2017. Now, with delivery of the additional cars for the New Shuttle, MHIENG will step up its marketing initiatives, both in Japan and overseas, emphasizing its carriages' achievements in superlative design, economic benefit and environmental performance. (1) AGT is the name given by MHI to its proprietary and innovative automated people mover (APM) transport systems devised to make effective use of space above roadways. Systems of this type have been developed in many Japanese cities since 1981. (2) Saitama New Urban Transit Co., Ltd. is a third-sector enterprise backed primarily by Saitama Prefecture and East Japan Railway Company (JR East). The New Shuttle line was inaugurated in December 1983. It currently encompasses 13 stations (Omiya in Saitama City to Uchijuku in Ina Town) spanning some 13 kilometers. As a transport system linking these suburbs with hospitals, schools and businesses in central Tokyo, the New Shuttle is playing an ever more important role in the lives of local residents. An unusual feature of the New Shuttle line is its minimum turning radius of only 25 meters, enabling S-curve operation through intersections without affecting ambient buildings. The adoption of rubber tires enables low noise and vibration--for minimal impact on the surrounding environment. Mitsubishi Heavy Industries (MHI) Group is one of the world's leading industrial firms. For more than 130 years, we have channeled big thinking into solutions that move the world forward - advancing the lives of everyone who shares our planet. We deliver innovative and integrated solutions across a wide range of industries, covering land, sea, sky and even space. MHI Group employs 80,000 people across 400 locations, operating in three business domains: "Power Systems," "Industry & Infrastructure," "Aircraft, Defense & Space." We have a consolidated revenue of around 40 billion U.S. Dollars. We aim to contribute to environmental sustainability while achieving global growth, using our leading-edge technologies. By bringing people and ideas together as one, we continue to pave the way to a future of shared success. Mitsubishi Shipbuilding Holds Christening Ceremony for Next-Generation LNG Carrier "MARVEL CRANE"